Status: offline Their website and chronology certainly seems to have gone dormant in 2010 - That's never a good sign. The names of the folks involved still seem to get mentioned in recent news on gaming. But I think as a viable game design entity they seem gone. Funny I'm just the opposite, lost my collection of board war games in a bad storm here in Florida, just mess on the computer nowadays. But pickings have been slim of late! Status: offline Yes, one of the founders and principal developers (Ian Trout) passed away sadly not long after Kharkov was released and that pretty much ended SSG. I am hoping more for something along the lines of what Matrix did for the Battleground/Campaign games that John Tiller did. Maybe it is my old age, but nothing in the last four or so years seems to hold my interests for any length of time if at all. Solitaire war/board games seem to fill that gap now. Status: offline Somehow I missed or forgotten about Ian Trout, sorry to here that! I see what you were meaning now. I share your not being able to 'hold an interest' - I also attributed it to age. Oddly, I want to play a great game more than ever, but just can't get into very many or can't find anything in my interest area. On my computer this moment all that is loaded is Command:Modern Naval and AIR, TOAW IV, Flashpoint Campaign Series and Combat Command 2. Most from Matrix. None of these are all time favorites but I dabble in them, and they are ok. Frankly I don't even have an all time favorite computer war game. Some board games yes, but they are all gone. I don't think I've ever seen a thread about SSG re-publishes. Maybe the new Steel Panthers will be entertaining, it was back in it's day. Don't read much about it lately though. The Next iteration of the Flashpoint series might be good too, Southern Storm. Armored Brigade I almost pulled the trigger on, but another NATO vs Warsaw Pact in the 70's or 80's I don't need. If that would have been a contemporary timeline I would have been much more interested. Status: offline SSG made my first wargames. Carriers At War and Europe Ablaze on the Commodore 64. I also used to buy Run 5 magazine. Very fond memories. SSG made my first wargames. 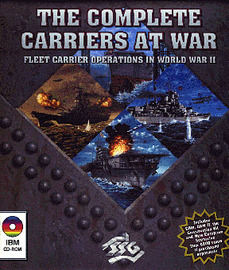 Carriers At War and Europe Ablaze on the Commodore 64. I also used to buy Run 5 magazine. Very fond memories. Status: offline This thread got me to re-install all of the Decisive Battles games after having played Kharkov for the last couple of weeks. Amazingly, they all installed and play beautifully, save for Battles in Italy which starts and runs fine, with one exception; I have all black terrain?!? Anyone have any pointers? It doesn't make sense that Korsun Pocket runs fine as does Normandy. Status: offline Maybe try some of the options in the windows compatibility section?? Status: offline I still have a bunch of Run 5 magazines. I have been buying board games of late. I am getting bored as well. Status: offline Yes, I would consider myself strictly a board gamer at this point. The only PC games that really interest me now are either board game ports or those that have a board game feel, ala Decisive Campaigns or TOAW. I also loved the SSG games and still am looking for one that keeps my interest. I find as I am getting older, less endurance in trying to play these games. Status: offline I play Carriers At War. It runs at higher resolutions (1920x1080 and 2560x1444) and I still find it very enjoyable. BiI, KP, Battlefront and Kharkov all run fine on my Win7, although I've never learned to play them. Status: offline I recently bought an old 1280x1024 monitor so I can run the SSG DB games in their native screen resolution. The original CAW ran on the Commodore 64. And probably on various Apples, Amigas and PC's. It might run on DoSBox, but I'm not familiar with using that. Ideally, I'd love to see it for Android tablets.